The Independent Police Review’s Annual Report shows community members filed 435 complaints against Portland police in 2016. It’s the highest number of complaints the agency charged with police oversight has processed in eight years. When Portlanders take issue with the behavior of a police bureau employee, they can file a complaint with the Independent Police Review. The agency, housed under the City Auditor’s office, determines whether the complaint warrants an investigation, mediation, dismissal or in minor cases, follow-up with the bureau to make improvements to service. According to its report released May 18, the most significant increase was in complaints related to police use of force, which more than doubled to 143 in 2016, up from 69 the previous year. The bureau has approximately 900 sworn officers in its ranks, and 397 had complaints filed against them. Police use of their hands, feet and knees garnered the most force complaints, with “other force” coming in a close second. This category includes allegations of pushing, grabbing and unnecessary or mismanaged use of force. Until 2015, the Independent Police Review and police bureau’s Internal Affairs Division dismissed or declined the majority of use-of-force complaints. But in 2016, they opened investigations on 94 percent of force complaints. Another increase was in officers who had multiple complaints lodged against them during the course of the year, with 49 receiving three or more complaints, up from 30 the previous year. Several had as many as five or six complaints. The report revealed that 32 officers were disciplined in 2016 – the majority receiving “command counseling,” which includes a note in their file and a debriefing by a superior. Six officers left the bureau while under investigation, and two were fired for misconduct. Additionally, African-Americans filed 56 percent, and Latinos 16 percent, of disparate treatment complaints. Police shootings were down from six in 2015 to two in 2016 – with one resulting in fatality. Both of the suspects who were fired at were white, stated the report. While the uptick in complaints against police this past year bucked what was previously a downward trend, the numbers continue to be lower than they were in the early 2000s, said Independent Police Review Director Constantin Severe. Back then, he said, his agency would receive about 700 to 800 complaints annually. He attributed increases in use of force and conduct complaints, in large part, to the many protests spurred by local and national political climates in 2016. While 10 complaints stemming from demonstrations led to full Independent Police Review-led investigations, decisions on whether or not those allegations will be upheld have not yet been made, he said. 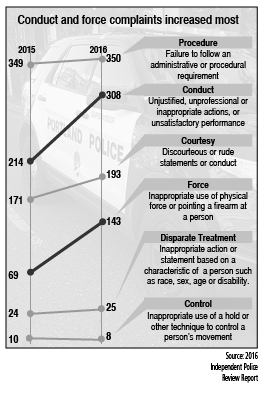 In 2016, the Independent Police Review and Portland Police Bureau’s internal affairs completed 80 investigations, upholding one or more of the allegations made by a community member in 22 cases. But it was the police bureau’s own internal affairs office that investigated the vast majority of complaints against the bureau. When this happens, the Independent Police Review reviews the police investigation. As part of the 2012 settlement agreement between Portland and the U.S. Department of Justice, the Independent Police Review is required to increase the number of investigations it conducts. At the start of 2013, the agency only had two and a half investigator positions. Today it has seven full-time positions, said Severe. This enabled it to conduct more of its own investigations in 2016 than any other year, with 29 cases initiated. In 2016, both the Independent Police Review and police department internal affairs completed investigations more expediently than in years past, with the median time of case completion falling well under the 180-day mark required by the Department of Justice. In order to further increase the oversight agency’s capacity to take on investigations, Portland City Council approved a code change on April 19 that will allow the Independent Police Review to send minor complaints directly to the police bureau employee’s supervisor for quicker resolution. There are many reasons the vast majority of complaints don’t lead to a full investigation. For one, the alleged misconduct must be in violation of Police Bureau Policy, and 107 complaints this past year did not meet this requirement. Additionally, the Independent Police Review must be able to identify the officer in question, which it could not do in 37 of the incidents. Altogether, 206 complaints were dismissed by IPR, fewer than in recent years. Severe said his agency has many tools at its disposal to figure out who the police bureau employee accused of misconduct is, even when the person filing the complaint did not obtain the officer’s name or business card. “If they can just tell us where it was and the time, a lot of times we can figure out who it was,” he said.